Building and maintaining a robust cybersecurity program is difficult and brings operational, organizational and personnel challenges that lack straightforward solutions. The number of cyberattacks on the enterprise is increasing, while the attacks themselves become more deceptive and elusive. Furthermore, the rate of adoption of new technologies and computing models by the enterprise, as well as regulatory and compliance requirements such as GDPR, continue to heighten security demands on organizations of all types. Enterprises must approach their security efforts holistically, paying equal attention to people, processes and technology. 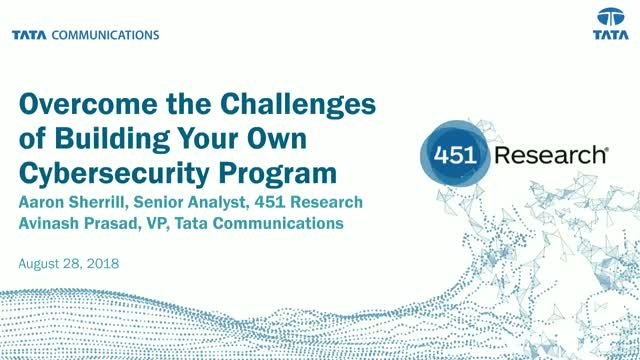 This webinar examines the challenges that come with building and maintaining an effective cybersecurity program, and it explores the opportunities, as well as the potential hurdles, around partnering with managed security service providers (MSSPs) to overcome these challenges.